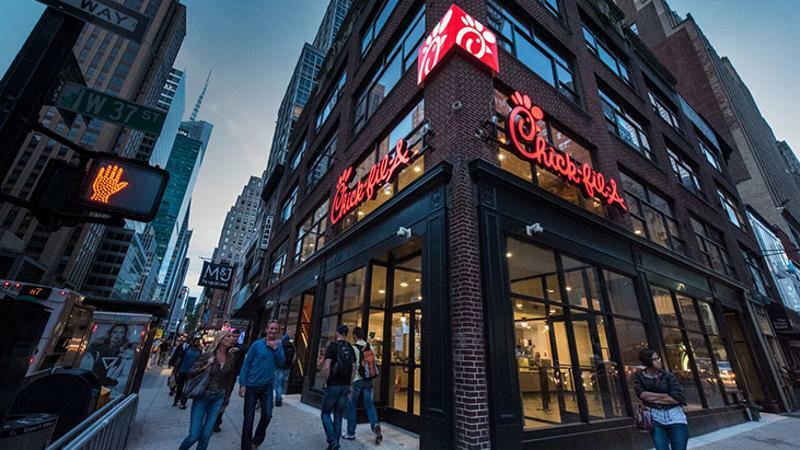 Chick-fil-A will open its first full-scale location in New York City Saturday, blending the blurring pace of that city with a chain known for taking its time with customers. The Manhattan restaurant, Chick-fil-A’s largest at 5,000 square feet, is tailored to meet the “busy lifestyle” of New York customers, the chain said. With raising throughput a primary focus, employees at the in-line restaurant will adopt a service process previously seen in a number of Chick-fil-A drive-thrus: iPad ordering. Employees will take waiting customers’ orders via the devices, ensuring orders are ready by the time customers reach the counter, Chick-fil-A said. The unit’s 84-seat dining room features the chain’s “Heritage” design, an homage to Chick-fil-A’s Georgia roots featuring such design elements as peach baskets and recycled Coca-Cola bottles. The New York City outpost is the first of several full-scale units planned for the city and its surrounding metro area, Chick-fil-A said. A second Manhattan store is slated to open in early 2016.